American Josh has lived in Xinjiang for over ten years and shares his experience and wisdom on his regional blog. Far West China is one of the few English-language Xinjiang blogs that has remained throughout Xinjiang losing internet access for over a year. This blog provides great content from a fascinating region of China. The main sections include guides and hotel information for Xinjiang province’s largest cities (namely Urumqi, Korla, Turpan and Kashgar), tips on seeking employment and moving to Western China, and information on the cultures and history of Xinjiang and the infamous Silk Road. The site is incredibly organized, beautifully presented, and contains articles and blog posts covering life, travel, and everything in between. Some of the past blog topics have included information on climbing Tian Shan, travelling in China’s primarily Muslim regions during Ramadan, details on the rioting that has been occurring throughout the province, details on seeing rarely visited areas of Xinjiang, and much more. The Resources section has good suggestions for books, movies, and media related to Xinjiang as well as maps and a link for a guidebook purchase. 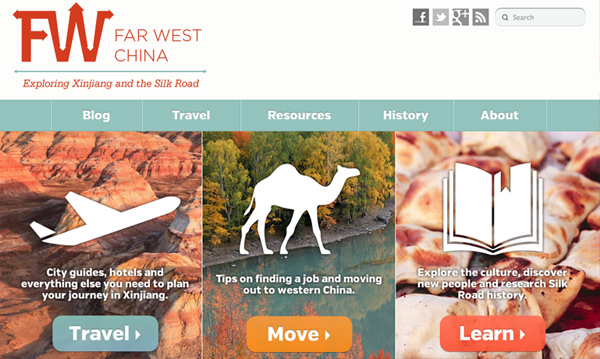 For any travellers or fresh faces in Xinjiang, Far West China is the best resource available on the internet. Posted on October 27, 2013 by danielleflaing. This entry was posted in Cities and tagged Xinjiang. Bookmark the permalink.